The field of character art is equal parts creative and competitive. It takes a lot of work to design relatable characters that fit into an imaginary world, and just as much work to build the artistic skill necessary to craft the designs. Great character art should consider anatomy but also delve deeper into the psyche of a character. It takes a lot of practice but if you put in the hours it is possible to break into the world of character art. But where should you get started? I would first recommend practicing the fundamentals but once you have those down you should move onto practicing character designs. These books will help you break out of your shell and get you comfortable trying numerous character designs. The first book you might add to your learning library is Digital Painting in Photoshop: Characters. It’s a very handy beginner’s guide teaching the art & craft of building convincing characters from your imagination. 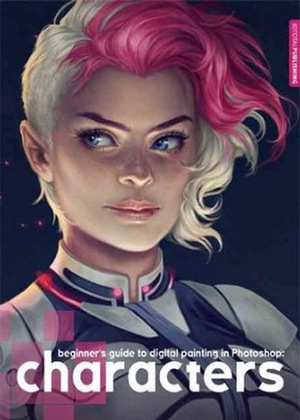 It features interviews and tips from established concept artists Charlie Bowater & Derek Stenning who have worked on major projects for companies like Marvel and Nintendo. Industry experts weigh in regarding character poses, artistic style, costume design, and matching the mood of a production. You get 224 pages of step-by-step instructions for getting started with character design painting in Photoshop. This means you won’t even need to have core painting skills, just an understanding of fundamentals and the ability to draw poses. 3DTotal is the publisher on this book and they’re known for high-quality guides on digital art. I’d recommend this book as the cornerstone piece for getting into character art for video games. Concept artists of all genres can learn something from this book, but it’s slanted towards more interactive storytelling like video games. 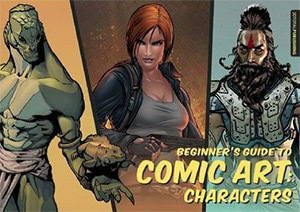 On the subject of comic books we have the Beginner’s Guide to Comic Art made specifically for character artists. This guide is perfect for artists who love the prospect of comic book art and want to pursue this as a hobby or career. You’ll learn about traditional comic workflows including storyboards, inking, posing, and coloring. There’s also a detailed intro chapter covering the fundamentals of lighting, composition, perspective and gesture. But you’ll learn a lot more from this book if you can already have these skills down. The Anatomy of Style is a better place to start if you don’t already have a solid understanding of drawing the human figure from scratch. Anyone who loves comics and wants to get better should pick up a copy of both books, but the comics character design book is especially useful. 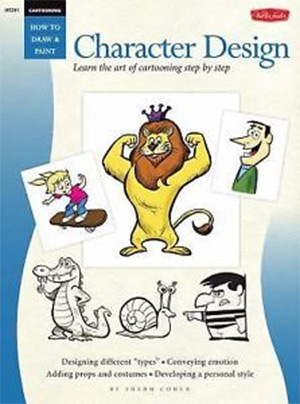 It’s specifically designed for character art so you’ll learn everything you need to create poses and characters that capture the reader’s attention. Joe Murray is an animator and creator two TV shows, one for Nickelodeon and another for Cartoon Network(Rocko’s Modern Life and Camp Lazlo respectively). His book Creating Animated Cartoons with Character is made for cartoonists and animators who want to build relatable cartoon characters. He offers tips that he learned while working on his two shows. Plus the book contains interviews with other creators like Stephen Hillenberg of SpongeBob SquarePants. 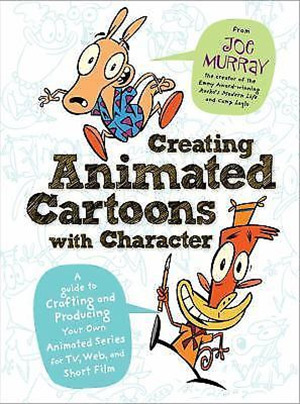 This book is like a casual conversation with major industry professionals willing to share their secrets of creating beautiful cartoons that captivate an audience. The book spans 240 pages and it’s certainly one of the best books for animators. You can learn a lot from this book even if you work as a storyboard artist or elsewhere in the animation pipeline. Everyone working in animation should understand character and this book is practically the ultimate reference guide. It’s surprising how many different character books are out there in the world. Here’s one that’s rather unknown and much pricier than others, but it can give you a jumpstart into any industry. 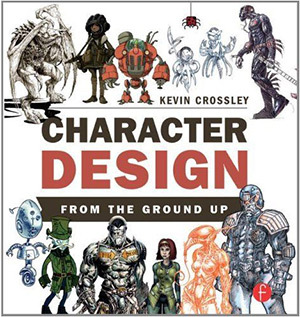 Character Design From the Ground Up by Kevin Crossley discusses character design from a media-agnostic viewpoint. 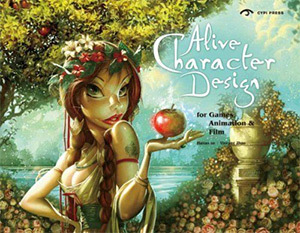 It covers illustration, comics, animation, and concept art with the same tenets and principles for great character design. In this book Kevin explains his process having worked as a concept artist for years. He explains the basics of raw materials and how you might go about creating characters both traditionally and digitally. He also explains techniques like thumbnailing, referencing photos, and moving from 2D to 3D if need be. It’s ultimately a book explaining how to create characters that look professional to higher-ups in the entertainment industry. Not everyone will need this book or be able to afford it. But if you’re at the point where you’re looking to break in then Kevin’s book may be a real asset on your journey. Character designers perform very similar jobs whether working in animation or video games. The book Alive Character Design realizes this fact and tries to compile information together into one source for everyone. Beyond anatomy this book also covers facial expressions and the importance of learning to draw emotions. By studying life and recognizing these important facets of character design you’ll greatly improve your own work and be able to critique the work of others too. There’s no doubt this book would help anyone that’s struggling to create believable characters. Many of these tips even apply to live action, although the book has lots of art tips specifically for entertainment artists. Tom Bancroft has over 25 years of experience working in the animation industry. I think it’s fair to say Tom knows character. 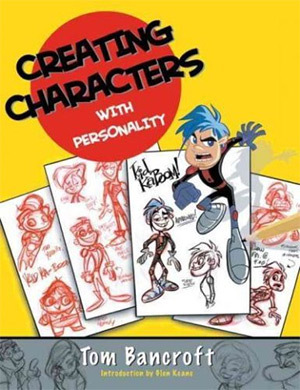 His book Creating Characters with Personality focuses on character design for every medium. Animated films, TV shows, video games, and comics/graphic novels are considered viable artistic mediums for character designers. And Tom covers it all in this 144 page guide to character design. You’ll learn more about character interactions by analyzing the personalities of every character you create. How would two characters work together in a situation? What makes each one unique? By asking questions you’ll come to interesting conclusions about your work and hopefully improve over time. The book also comes with exercises to improve your character concepts and makes you think more critically about your design work. 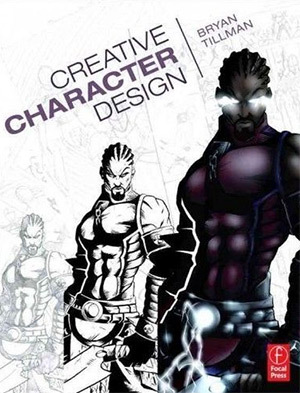 This is one of the most affordable and interesting character design books out there. It’s written by Sherm Cohen who was the storyboard director during the best episodes of SpongeBob(seasons 1-3). Sherm still teaches classes about storyboarding and character design using his industry experience to guide others on their paths into animation. His book Cartooning: Character Design is very cheap but also a great reference guide. It’s super short counting only 32 pages in total. But every page is filled with practical lessons that you can apply to every single character you design. You’ll see how basic shapes can be manipulated to design incredibly unique characters. Sherm also demonstrates how moods and facial expressions play a big role in character design. Because Sherm is such a talented artist he includes a lot of visuals. The book is a very quick read but it’s a handy reference to have if you’re interested in cartooning & animation. One alternative that I’d recommend is Cartooning: The Ultimate Character Design Book by Christopher Hart. Chris has written several how-to books for aspiring artists but this one is a little more advanced with pertinent info for aspiring character designers. Sherm and Chris offer unique yet valuable tips for cartooning, so if you’re feeling froggy you might even pick up both. Archetypes and symbols can portray incredible characters when used properly. Creative Character Design teaches these more advanced topics explaining how characters should be more than just how they look. Every character has a story and you should use that story to help you find the design. A blank sheet of paper can be very intimidating. But once you have a direction your job becomes much easier. The author explains theory and philosophy combined with actual techniques for crafting brilliant characters. The book features reprints of model sheets and professional production work to show you what a finished character design should look like. I would only recommend this book to serious character designers who want to take the next step. Concept art is tough work and if you’re looking for it to become your career then Creative Character Design may be the greatest investment to help you break into the industry. I wanted to add this in at the end of the post because I feel it’s incredibly valuable to digital concept artists looking at the game industry. ZBrush is a powerful rendering program for designing characters and textures. ZBrush Character Creation is the ultimate introductory guide to this program made for character artists. Currently in its 2nd edition, this book spans 430+ pages of lessons and exercises for mastering ZBrush. It’s a beastly program and it’s definitely on par with Photoshop regarding the number of tools and techniques you can learn. However not everyone who does concept art will want to use ZBrush. That’s an important point to remember because ZBrush models are primarily used for 3D rendering. It’s possible for 2D artists to use this program but it’s not always a staple in the 2D production pipeline. 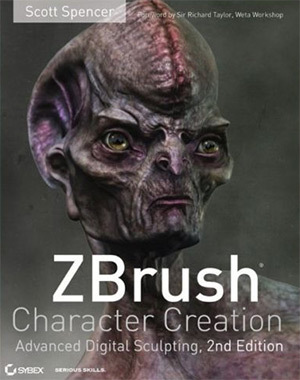 But ZBrush is an industry program used by many AAA game studios. If you really want to delve further I’d also recommend ZBrush Characters and Creatures covering workflows and live examples. Anatomy for 3D Artists may also be useful but it’s not exactly made for ZBrush. It all depends what type of character art you want to make and what sort of projects you want to work on. But no matter what you choose there’s always room in the industry for more great character artists. Your portfolio is the one thing that will set you apart from the herd. These books will set you straight towards building a real competitive portfolio of work. Anyone that’s serious about character art should take another look over this list. Figure out what stage you’re at in your artistic pursuit and grab a copy of any book(s) that resonate with you. Nothing can replace hard work and practice. But books that guide you with exercises will improve your practice and build your confidence as a character designer.